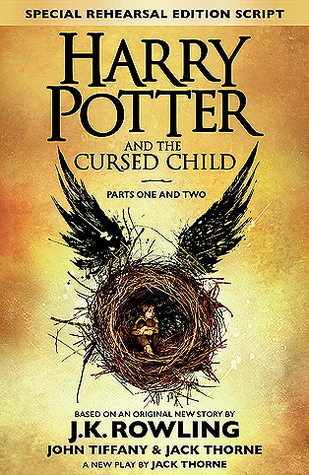 You may be aware that a certain Harry Potter is back! Not that it has been mentioned much in the press over the past few months!! As a fan of the original books, and then the films, I've been rather excited to get my hands on a copy of the latest installment - set 19 years later and featuring Harrys' children as they set off on their Hogwarts experience! I didn't manage to make it to a bookstore with a midnight opening, although looking at some of the photos online today they did look like an awful lot of fun! But I managed to have my copy delivered this morning, so the housework and real life have been forgotten about this afternoon so I could sit out in the garden, in the sunshine (thankfully!) and lap this up! And that is exactly what I did!! It was an extremely easy book to read as it's in script format, so no padding! Just the bare essentials of the conversations and minimal descriptions of the scenes. But as a Harry Potter fan I don't think those are needed as we all have the images marked clearly in our heads! I even imagined the characters as they were in the film, just older! Even though the play has re-cast the characters I just can't imagine anyone other than Daniel Radcliffe, Emma Watson and Rupert Grint playing the main three! Reading this was just like being transported back to the early Harry Potter books as it was pretty simple and easy to jump straight back into. Many old themes were re-introduced so it was just fun to relive the old alongside the new! 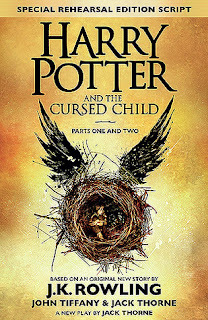 Full of a few surprises and twists I thoroughly enjoyed my dip back into the world of Harry Potter and I'm just hoping that there may be more visits in the future!! Pretty please J.K. Rowling!! !